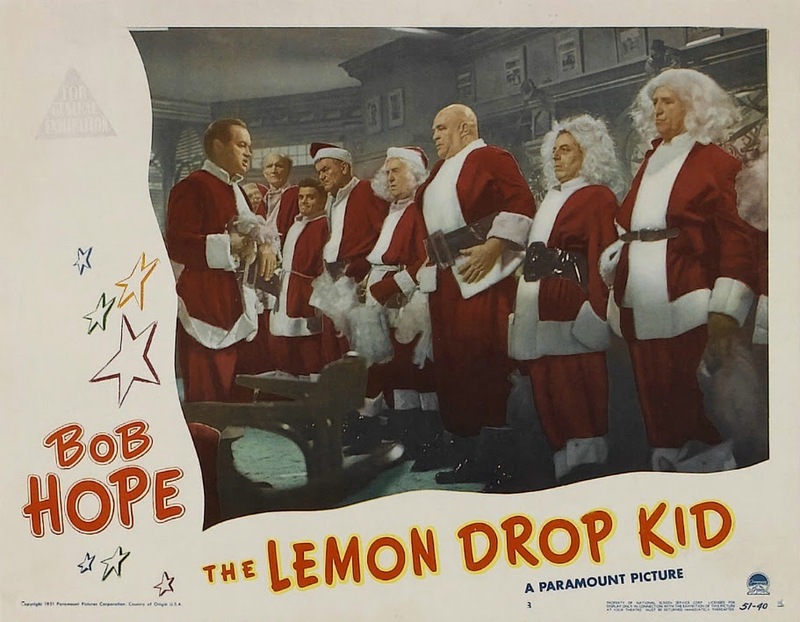 Sidney Melbourne (Bob Hope): Santy Claus don’t drink. Gloomy Willie (William Frawley): Oh, no? Well, how come he’s always falling down chimneys? Damon Runyon and Bob Hope make a terrific combination in The Lemon Drop Kid (1951). Based very, very loosely on a short story by Damon Runyon, the film is filled with the usual Runyon collection of colorful and humorous, unlike crooks in real life, gangsters. Hope takes center stage as the Lemon Drop Kid, a cowardly and incompetent, in other words the personae Hope normally assumed in his film comedies of this period, racetrack tout. He dreams up a scam involving the establishment of an old age home for old gangster wives and molls in order to pay off gangster Moose Moran the $10,000.00 he owes him, and to escape Moose having surgery performed upon him sans anesthesia. In the end, nobler sentiments stir within him, and Hope foils the gangsters, saves the old age home and stages an affecting reunion on Christmas eve between an elderly gangster released from prison and his wife, Nellie Thursday, after whom the old age home is named. Hope is ably supported by a superb cast including Lloyd Nolan, William Frawley and Marilyn Maxwell. The song Silver Bells featured in the video clip at the bottom of this post, which has become a Christmas favorite, made its debut in this film. (Kid): You a real doctor? (Sam the Surgeon): Practically. Woulda graduated if I hadn’t dropped a forward pass my senior year. It is a treasure. Oh, for the days when comedy was funny.